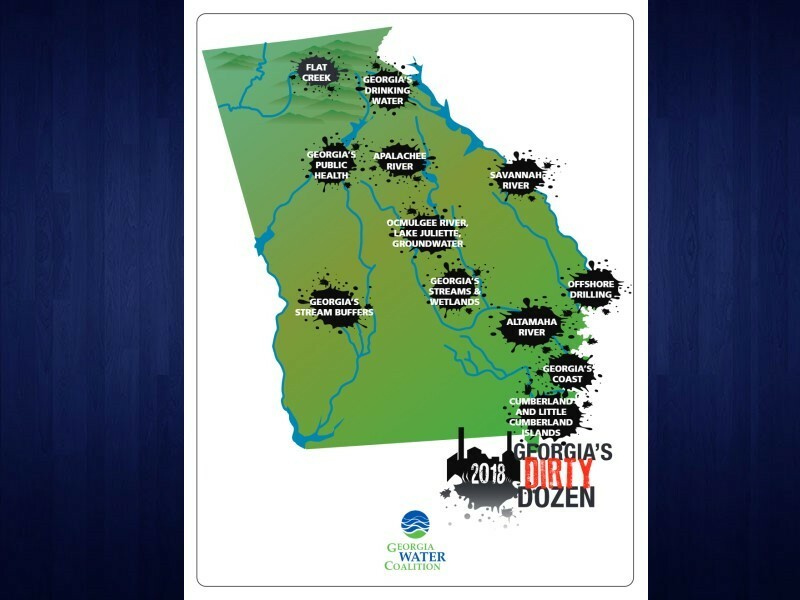 For the eighth year running, the Georgia Water Coalition has issued a list of what it calls its "Dirty Dozen," a list that spotlights places and practices that the group says endanger Georgia's water quality. The 2018 Dirty Dozen report lists specific parts of the state where water quality has been deemed endangered, but the report focuses more specifically on practices and procedures that contributed to the problem areas. Among the 12 on this year's list are Flat Creek in Dawson County and a landfill in Banks County, both in the North Georgia area. According to the report, lack of funding for the Georgia Environmental Protection Division (EPD) has left just one part-time and two full-time employees with the job of inspecting 2,800 facilities across the state. The report stated that EPD received less funding in the FY 2019 budget than it did in 2005. "This lack of funding has contributed to tragedies like the March chemical spill at a Dawsonville chicken processing facility that led to the deaths of more than 8,000 fish on Flat Creek," the report stated. "EPD industrial stormwater staff had not reviewed and inspected the facility’s stormwater pollution prevention plan in the previous five years." In addition, the report points the finger at Georgia Power Company for putting pressure on Georgia politicians to keep coal ash tipping fees low across the state. Currently, there are six regional landfills that accept coal ash, including one in Banks County in North Georgia. The report said the tipping fees for coal ash are 60-percent lower than tipping fees for regular household garbage. "The deal also exposes Georgians to more toxic coal ash shipped from out of state," the report stated. The full 29-page report is available via this link.